The “law on fans” tightens the sanctions on fans who violate the rules of conduct at sporting events. It introduces a ban on attending matches, fines of up to nearly $800 and up to 15 days of administrative arrest. The State Duma has passed amendments to the federal law On Physical Education and Sport in the Russian Federation, which has been generally branded as the “law on fans.” The law tightens the sanctions and fines on fans who violate the rules of conduct at sporting events. It introduces a ban on attending matches, fines of up to nearly $800 and up to 15 days of administrative arrest. The “law on fans,” passed by the State Duma in its third reading, turned out to be much tougher than the original draft law. The law retains the essential novelties of Russian soccer—for example, the introduction of controllers or stewards, who secure order in the stands (the police operate outside the arenas). However, the liability fans assume for violating the rules of conduct at sporting venues has been stepped up. The law involves introducing “a list of individuals banned from attending the venues of official sporting events on the days these take place.” The list will be compiled by “the federal executive body in the internal affairs area.” In other words, the law deals with the legal underpinning of the creation of a “blacklist” of fans, to be unofficially run by the Ministry of the Interior. “Video- and photo-surveillance are very handy in solving many problems, whereby the police won’t have to look for the offender in the mob. The photos will reveal their identity, and the offenders will be handed a subpoena at their place of residence. The Ministry of Interior will compile the lists of fans banned from visiting sporting events. The ban itself will be adjudicated at the discretion of the court,” says Igor Ananaskikh, chair of the State Duma Committee on Physical Education, Sport and Youth Affairs. Incidentally the idea has already been adopted by some soccer clubs. 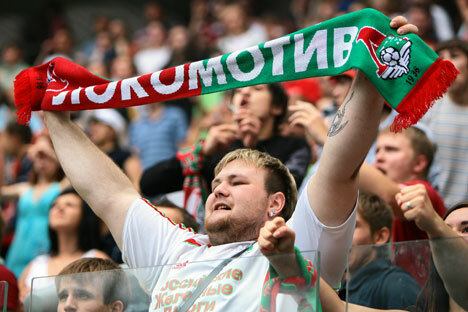 For example, team Lokomotiv introduced its own “blacklist” last year, causing fallout with the fans. The amendments to the law further stipulate that fans banned from attending sporting events will also face hefty fines of up to 25,000 rubles (about $770), or an administrative arrest of up to 15 days. It should be noted that the regulation of fans’ conduct in the stands was rigid enough before these amendments. However, previous measures did not aid the police in punishing those guilty of involvement in the case that received the most attention in the past season, when a flare thrown from the Zenit stands exploded at the feet of Dynamo goalie Anton Shunin and injured him. The game was stopped, the fan section was shut in, but the guilty were not identified. The idea of introducing “a law on sports fans” has been in the air for the last few years. Two fallouts in Russian soccer last fall catalyzed its conception and passage into law by state authorities. On Sept. 26, the Cup of Russia match between Moscow’s Torpedo and Dynamo was stopped, after Torpedo fans bombarded the field with flares and smoke-puff charges, in a protest against the club’s policies. On Nov. 17, a similar incident had more severe consequences. During the Dynamo- Zenit match at the Khimki stadium, a firecracker thrown from the Zenit fan stands exploded by Dynamo goalkeeper Anton Shunin. The game was stopped. Shunin suffered a corneal flash burn, and Zenit was punished with a forfeit defeat and two subsequent games to be played in empty stadiums.